From Monday 25 June 2018 until Friday 31 January 2020: Enjoy 30 % off! From Thursday 1 November 2018 until Friday 31 January 2020: Enjoy 15 % off! From Wednesday 16 January 2019 until Saturday 11 May 2019: Enjoy 25 % off! From Wednesday 16 January 2019 until Saturday 11 May 2019: Enjoy 35 % off! From Tuesday 23 April 2019 until Sunday 5 May 2019: Enjoy 20 % off! From Tuesday 23 April 2019 until Sunday 5 May 2019: Enjoy 35 % off! From Friday 22 March 2019 until Monday 6 May 2019: Enjoy 17 % off! 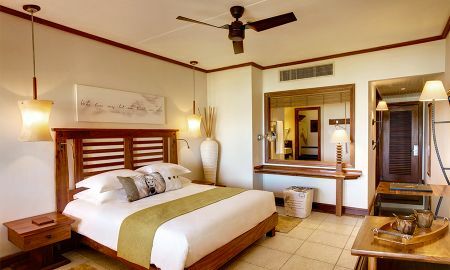 The balance of luxury, simplicity and friendliness combine at the Heritage Awali Golf & Spa Resort, in an all inclusive establishment ideal for families. Tailored for legendary hospitality, its exceptional range of activities and facilities ensure the adventurous relish in a range of delights amidst the backdrop of an unforgettable tropical getaway. The wide range of guestrooms offer a combination of elegant comfort and style. 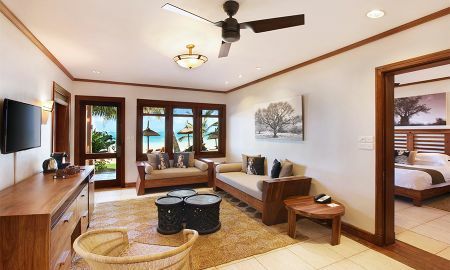 Spacious and overlooking the Indian Ocean, each sea view combines a palette of warm colours and graphic patterns that originated on the African continent for unrivalled contemporary surroundings. 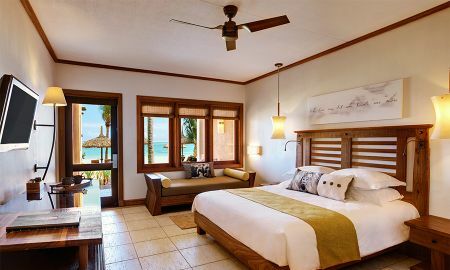 Teemed with deluxe amenities, including complimentary Wi-Fi internet connection, each beautifully-appointed abode is outfitted with soft plush furnishings, while selected accommodation boast separate living areas, stunning views of the turquoise lagoon and direct access to the beach. With a plethora of restaurants and bars on the Domaine de Bel Ombre, experience fine dining from Mauritian, Japanese to French cuisine. Whether at the start or end of the day, the delicious buffet served nourishes and stimulates the body. The colourful and festive atmosphere is matched by the symphony of flavours, while exquisite Mauritian sourced products are infused in the enchanting setting of this 19th-century property filled with history and culture. The adept team of dedicated chefs create concoctions of tantalising temptations both indoors and beachside. Snacks and light meals can be found by the pool side for those who want to make the most of the sun, while the lively background music transforms the bar into a vibrant cocktail lounge in the evenings. In the Seven Colours Spa that features a wide range of soothing massages and treatments, indulge in being pampered by the convivial professional therapists that tailor to every individuals’ needs. Furthermore, guests find the dedicated trendy beach club and the award-winning Heritage Golf Course irresistible, while the Frédérica Nature Reserve and kids club include several fun activities to entertain. Mauritius offers something for everyone. For those who want more than a beach holiday there are a number of world-class golf courses nearby, as well as a host of water sports such as kite surfing, deep sea fishing and scuba diving. Exploring villages and markets is a must providing an insight into a rich colonial history with fascinating local culture. The Sir Seewoosagur Ramgoolam International Airport in Mauritius is 45 km away. The compulsory fees for Christmas’ Eve (December 24th) and/or New Year’s Eve of December 31st are not included in the total price of the room; they will be charged directly by the hotel, on arrival or departure. A supplement of EUR 150 per adult or teen(12 - 17 years) and EUR 75 per child(02 - 11 years). One complimentary green fee per person per day at the award winning Championship Heritage Golf Course. Validity : 01 Nov 2018 to 31 Jan 2019 only. New Year Eve Supplement : 150 €/person (on request). Christmas Eve Supplement : 150 €/person (on request). There will be limited or no access to the Heritage Golf Course from the 25th November to the 8th of December 2019, and no access to C-beach Club from the 1st to the 8th of December 2019.